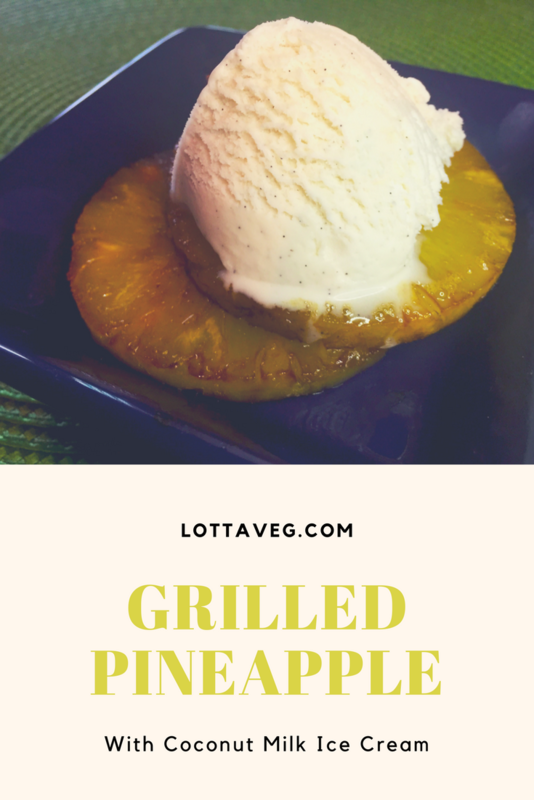 This Grilled Pineapple w/ Coconut Milk Ice Cream is great for a special treat, especially with fresh pineapple. Enjoy with a scoop of your favorite nice cream. Pineapple is one of my favorite fruits so Amelia wanted to make me a special dessert for me. She also has an allergic reaction when she eats raw pineapple…it makes her mouth burn. But when it’s cooked, it doesn’t bother her so we can both enjoy it. We bought a pint of So Delicious Vanilla Bean Coconutmilk Dairy-Free Frozen Dessert, but you can use your favorite non-dairy ice cream or even make your own. 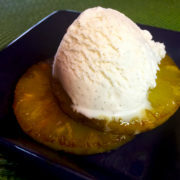 The warm tart grilled pineapple combined with the cold sweet nice cream is oh so delicious. It’s making my mouth water just thinking about it! If you make this recipe, please let us know your thoughts in the comments below. And please share with your friends to help spread the word about healthy plant-based eating. 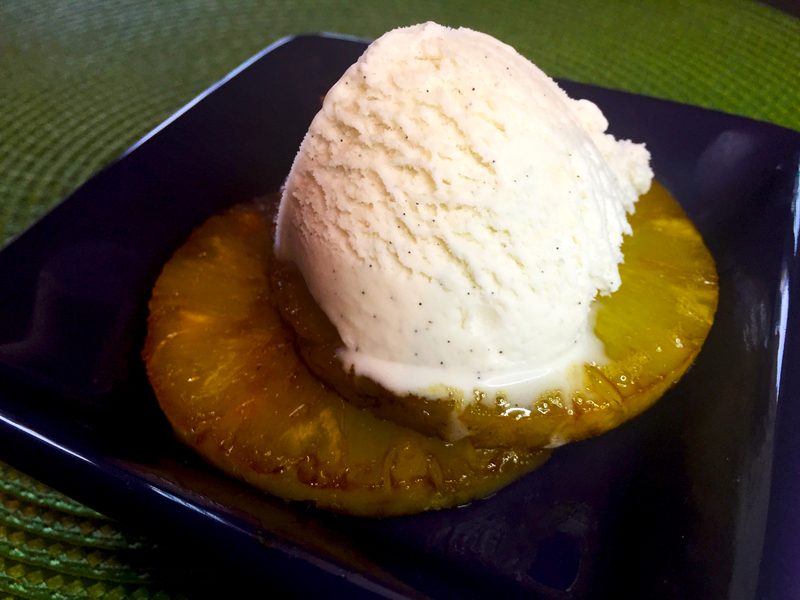 This Grilled Pineapple w/ Coconut Milk Ice Cream is great for a special treat, especially with fresh pineapple. Enjoy with a scoop of your fav nice cream. 8 slices pineapple rings canned or fresh pineapple. If using fresh remove core and slice into rings. Dissolve brown sugar into the rum and place the marinade in a large ziplock bag or baking dish. Add the pineapple slices. Coat the slices thoroughly and place in the refrigerator to marinate for 30 minutes. Heat a grill and cook the pineapple until lightly browned, about 2-3 minutes. Flip and grill the other side. You can also grill on an electric skillet. Enjoy with a scoop of vanilla coconut ice cream or your favorite vegan nice cream. Serving size is 2 slices of pineapple and 1/2 cup of nice cream.